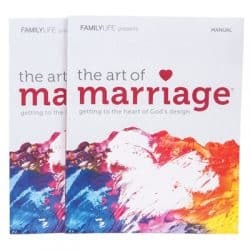 The Art of Marriage video event features over 40 ministry leaders who provide biblically-centered teaching, while couples who have struggled in marriage share their stories of pain, loss, forgiveness, and grace. This six-session "event on video" can be hosted by anyone, anywhere, using the Christian marriage videos. Contact FamilyLife for more today. It includes everything you need to promote, host, and facilitate a Christian marriage seminar event. When you have an estimate of the number of people attending your event, you will want to order enough Couple’s Sets for those attending.